+Allied Hispanic graciously sent a digital dvd code of this +Disney pelicula to BB. All opinions stated are 100% Babushka. SYNOPSIS: Disney presents a Roald Dahl classic directed by Steven Spielberg. 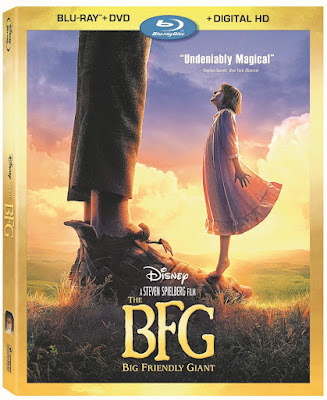 In an imaginative tale filled with magic, wonder and unexpected friendship, a young girl is launched on an enormous adventure when she crosses paths with a mysterious being called the Big Friendly Giant." "CAST: Mark Rylance as the Big Friendly Giant; newcomer Ruby Barnhill as Sophie, the orphan who befriends him and is swept into a world of rampaging giants; Penelope Wilton as The Queen; Jemaine Clement as Fleshlumpeater, the most fearsome giant from Giant Country; Rebecca Hall as Mary, The Queen’s handmaid; Rafe Spall as Mr. Tibbs, The Queen’s butler; and Bill Hader as Bloodbottler, another unruly giant from Giant Country. SUBTITLES: DVD = English SDH, Spanish and French "
A clasico come to life, and now you have a chance to ganarlo. Kidding? JU SO FONII!!! Por supuesto this classic must offer a classic. Gracias a mis amigos at Allied Hispanic, one of you Beautifuls will be enjoying this in your very own casita. Or phone, or computadora... a digital dvd copy of The BFG will be sent to the winner. and here is where you can enjoy more about it on the web.